Now that Scott Walker is trailing in the polls, he is becoming desperate. He has been campaigning Al Dente, just hoping something sticks. His latest attack on Mary Burke showed how distressed his campaign has become. 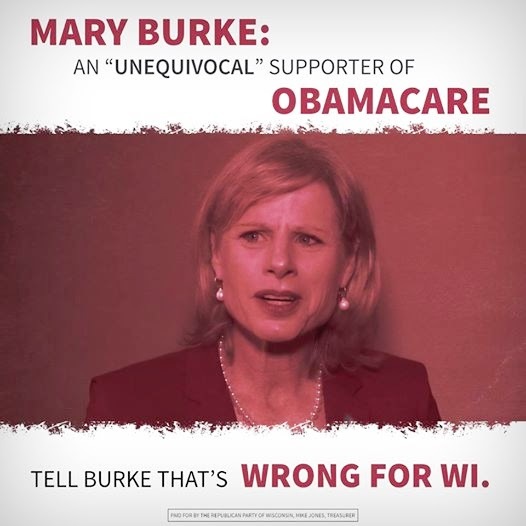 The person who cost Wisconsinites hundreds of millions of dollars to prove a hyper partisan point is now trying to campaign on healthcare? It shows how disconnected he actual is from reality! "Luckily to be an Obamacare critic, being right is not a job requirement". The question to Scott Walker, what in this law do you disagree with? Seriously Governor...you are making a campaign issue over Health Insurance modeled after Romney Care...a republican concept. You need to pee in a cup and show us you are not on drugs. Remember also that Romney Care was plagiarized from Nixon Care; and that was plagiarized from Trumann Care. The state had to pay hospitals $73 million due to the dollars they are losing by Walker's denial of basically free medicaid money. This guy is no conservative.